Difficult customers can give customer support a hard time. Still these customers are a great asset for any company, as in most cases the level of customer support offered by the company will be judged by how their agents handle difficult situations and not how they accept praises. Learning to communicate with dissatisfied customers effectively is the essential part of the customer service training. 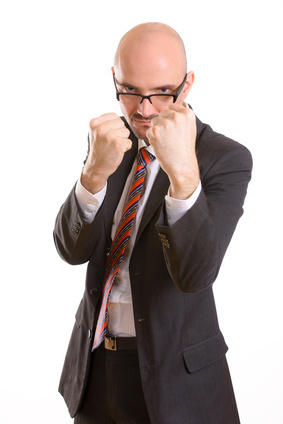 It is no secret that many reps when faced with an angry client fail to maintain their competence and fall into being defensive, submissive or aloof. None of these behaviors unfortunately can be associated with great customer service. So why is it always difficult to communicate with a customer who is disgruntled? It seems that although we may have learned to keep calm on the surface and remain polite to the customer, we still treat them as an enemy, someone who is taking out their aggression on us, while in fact we should position ourselves as the customer’s ally. Despite the fact that customer service is hired by the company, it is hired to look after the best interests of the customer and not the company. Customer service reps are used to thinking of themselves as the advocates for the company, which is the biggest attribute of the wrong customer service vision. With this mind-frame they raise a wall between themselves and the customer, which prevents effective communication and makes it impossible to arrive at a solution. If we see someone as an enemy and aggressor, emotional detachment, hostility or nauseating obedience on our part are an inevitable reaction. And the customer can’t help but to feel it. Even if a solution to their problem has been offered, they are less likely to leave with a good impression of their experience. The primary task here is to cultivate the proper vision of your role as a customer service link. You are to think yourself in the same camp with the customer, his confidant in a way. If he is angry, he is angry at the situation and not at you personally. In fact you are his hope and he is turning to you for help. You are to go out for him and explore the situation and suggest possible solutions. Be genuinely on the customers side, and make sure to let them know about it, so that they don’t feel you only pretend it. Please feel free to share your thoughts and experiences in the comments. We’d love to hear about them. This entry was posted in Articles and tagged how to deal with angry customers, how to treat difficult customers. Bookmark the permalink. Hi Maria, i agree that we must be customer friendly, but at this same time be an advocate of the company. the case that the customer is condemning the product or the company, we just need to keep calm first and after fixing the problem, we try to explain and even persuade the customer against believing in condemnation of the product or the company. We renew/re-established the image of our product and the company , restoring the customer confidence in the company. We do these each time we visit the customer by spending little time after work with customer,especially when we go for preventive maintenance. teaching them how to handle little problems on their own and making sure they call us whenever the need arise. conclusively, a CSE is a CUSTOMER ALLY AND COMPANY ADVOCATE. Thank you for your comment, Adeleke. I really like your statement on CSR to be a customer ally AND company advocate! That would be ideal situation. But I must admit it is very hard to achieve. Trying to play 2 characters at the same time – only few top performers can handle it. My idea is that we take the pressure of having to look after the company’s needs from CSRs and shift it to their supervisors and managers of the company to let the support people care for the customer and develop the inner qualities necessary for good customer service. That is my point anyway, which is more of a psychological observation 🙂 I appreciate your opinion very much, as well as your time to share it with me and our readers. Thanks for your insights Maria, interesting perspective. One trap that many people fall into in critical customer situations, is getting emotionally involved and respoding to the behaviours of an angry customer. However, what an angry customer really wants to hear is the calm voice of someone who is in control, understands their needs and is willing to pull out all the stops to get this fixed. You need to adopt the demeanour of a nurse or doctor in an ER, a patient is in real trouble and they are distressed, The last thing the patient wants to see or hear that the person the place their hope in is emotional or distressed as well. Look after your customers and your customers will look after your business. Jim, thanks for sharing your view. I really like your comparison to doctor and patient! It is exactly what it feels like. At the end of the day, when the customer is angry the primary task for any CSR is to diffuse the client’s anger and this requires nothing less than the patience of a nurse 🙂 You hit the bull’s eye there. The change in the very approach – “Customer service reps are used to thinking of themselves as the advocates for the company, which is the biggest attribute of the wrong customer service vision” is pretty interesting. It does give a mindset to defend the company – just like an attorney. I guess the approach as an ‘consultant’ would be great as the end user should not think of CSR as a company loyalist. Anyways, its always advisable to let the customer vent out his/her anger because once done, they would be relaxed and would be more that willing to listen and understand. Interrupting the customer while he is venting out (other than being abusive/using profanity) would be the last thing one can do. Letting the customer to first vent their frustration is definitely part of the process, perhaps the most important part, like with any good psychotherapist. Attention to what they say is the first thing telling the customer that you actually care. So agreed on that as well. Thanks a lot for sharing your opinion, I appreciate it. Excellent article, I have experienced these situations on several occasions. Another thing to remember about angry customers is that if you listen and truly empathize with them, you will connect to them in a more personal manner. I agree up to a certain point on this and feel that my customer service skills are very good. However, when you are shouted and screamed at, even threatened, then you have to take a stand. I was faced with this on one occasion as a promotor for a building company. Because of my administrative background I also luckily took a lot of handwritten notes and always kept my notebooks! On this occasion, the client had returned to check on the progress of the building of her villa and the installation of floor, kitchen and bathroom tiles that she had selected when she bought the villa. To my horror she came into the office shouting and screaming at me that I was an “idiot”, that I couldn’t organise anything, that all the choices that she had made had not been done etc etc…. One selection being wrong you could understand but all of them? I obviously tried the calm approach and checked in front of her that mistakes had not been made by the builders or in the ordering (even though I had already personally checked it all before she came to view). I also brought out my trusty notebook too… everything was correct! She wouldn’t have it though and continued to hurl abuse at me and would have hit me if she had not been held back by the agent and her husband. In the end, I asked her to leave the office and also threatened to call the police if she didn’t. Luckily my boss at the time was very understanding (especially as there had been no witnesses apart from the husband and agent) and knew that it would take an awful lot to make me do that. He was very supportive and we did refuse to change everything as she tried to demand without a further payment. Sometimes you cannot win and must know how and when to react.